Four years after gasoline prices spiked and carmakers threw themselves into developing models with vastly improved fuel economy, those new vehicles are arriving -- and cleaning up against older, less fuel-stingy competition. Four of this year's hottest models are the Toyota Camry, Volkswagen Passat, Hyundai Sonata and Kia Optima -- all redesigned mid-sized sedans with the heady mid-30s highway mpg ratings previously limited to small cars. And more are on the way. Last week Nissan began shipping redesigned Altimas to dealers, and Chevrolet, Ford, Honda and Dodge get redesigned mid-sized sedans this fall. The bad news? They aren't here yet -- and that has been a drag on the market as some shoppers wait for the redesigned models and spurn the current-generation, lower-mpg vehicles that soon will be replaced. Coupled with the capacity limitations facing Toyota, VW, Hyundai and Kia, that means the industry is likely to be short of high-mpg mid-sized car inventory all summer. That will make it more difficult to return to the 14 million-plus monthly selling rates of January through April. The May slide to 13.8 million was blamed in part on scarcity of the high-mpg hits. Czubay: Mpg is top priority. The changeover to high-mpg models, in all segments, is the key market driver this year. Dealers say it has been the release valve on pent-up demand as fuel prices soared. "Fuel efficiency continues to be a top purchaser driver," said Ken Czubay, Ford's U.S. sales boss. Total U.S. vehicle stocks have been falling all year, down to a 52-day supply on June 1, from 66 days on Feb. 1. But car stocks are even tighter: 43 days on June 1, down from 60 five months earlier. Toyota and Kia started June with only enough cars to last 25 days; Hyundai had just a 22-day supply. Dealers can sell new models with advanced fuel efficiency at or near sticker, while outgoing models require hefty incentives. For example, the redesigned 2013 Malibu Eco with 37 mpg highway -- a mild hybrid that was introduced before the gasoline-engine versions -- has only a GM incentive of 2.9 percent financing for 60 months, and is the only model not eligible for a $1,000 cash discount for Saturn owners. But outgoing 2012 Malibus have a factory incentive of $4,000, or a combination of cash and 0 percent financing. Even GM employee discounts are lower on the 2013 Malibu. "We just don't have to discount the new Malibu," said salesman Mike Blake at Wally Edgar Chevrolet in Lake Orion, Mich.
Sure, buyers always crave the latest model, but it's different this time. Not only is the sheet metal fresh; fuel economy is significantly improved. For example, though it hasn't yet been EPA-certified, Ford projects that the 2013 Fusion with a 1.6-liter EcoBoost engine will get 37 mpg highway, compared with 33 mpg for the 2012 Fusion powered by a 2.5-liter naturally aspirated four-cylinder engine. The four brands with redesigned mid-sized cars already on the market are scrambling to make more cars. -- Volkswagen is adding a third shift at its Chattanooga plant to boost capacity to 180,000 Passats a year from 150,000. In May, VW Group of America CEO Jonathan Browning said VW has calculated the cost of expanding to 250,000 a year. -- Kia's West Point, Ga., plant, which builds the Optima, is working overtime. -- The Montgomery, Ala., plant, where Hyundai builds the Sonata, will stay on daily and Saturday overtime until it adds a third shift in September, "and then we'll see," a spokesman said. 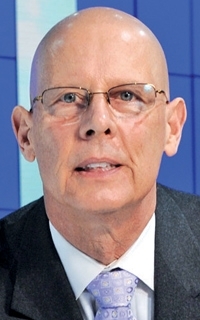 Hyundai Motor America CEO John Krafcik has said the brand's sales growth this year will be limited by capacity. -- Toyota has scheduled daily and Saturday overtime at most North American plants through summer. Camry sales are up 44 percent through May -- and, yes, more supply after last year's Japan earthquake has a lot to do with it. But so does improved fuel economy on the redesigned version that arrived last fall. The 2012 four-cylinder gets 25 mpg in the city and 35 on the highway, compared with 22/32 for the model it replaced. Said Toyota Division General Manager Bob Carter: "A large percentage of the increase is the consumer response to the new car."